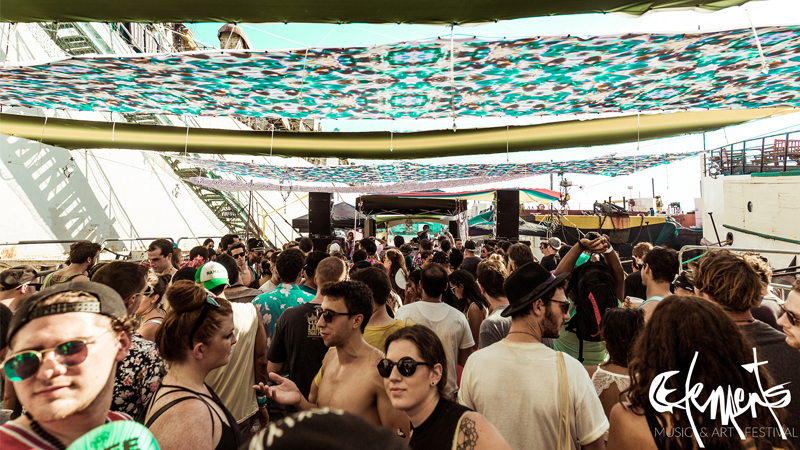 Elements festival took place on a melting hot afternoon, in an abandoned granary location by the Redhook dockyards in South Brooklyn. We didn’t really know what to expect and the first thing that hit us as we walked in were the old, out of use ships that towered around us, with colorful party goers, fittingly (un)dressed for the blazing temperature , streaming in and around the festival site. Definitely plus points for the industrial setting that made for a unique, dystopian vibe right from the get-go! We made a beeline for the front of the nicely sized and open-air Zero stage, which, given our musical leanings, we fully expected to be our main attraction of the day. The blond, petite, awesomely tattooed and beaming All Day I Dream darling Oona Dahl was just taking over the decks. She eased into her set and eased us into our surroundings, as we took in the ships to our left and right, and decided to embrace the intense sunshine instead of chasing the shifting shadows underneath the overhead cloth ceiling. No matter that it was hot af, it still felt amazing to be dancing under a bright blue sky to some beautiful beats. Despite an already grooving crowd, there was plenty of space to fling your limbs about without annoying your neighbours – basically, summer-time perfection on a Saturday afternoon during an August heat wave in NYC. Mellow vibes prevailed for the first half of Oona Dahl’s airy, melodic set and then, just over an hour in, as if magically reading our minds, she lay down a brief spell of intense and repetitive beats, marking the beginning of the deeper second half. Nice progression, although she still took it back to a lighter note before handing over to YokoO, who was up next. 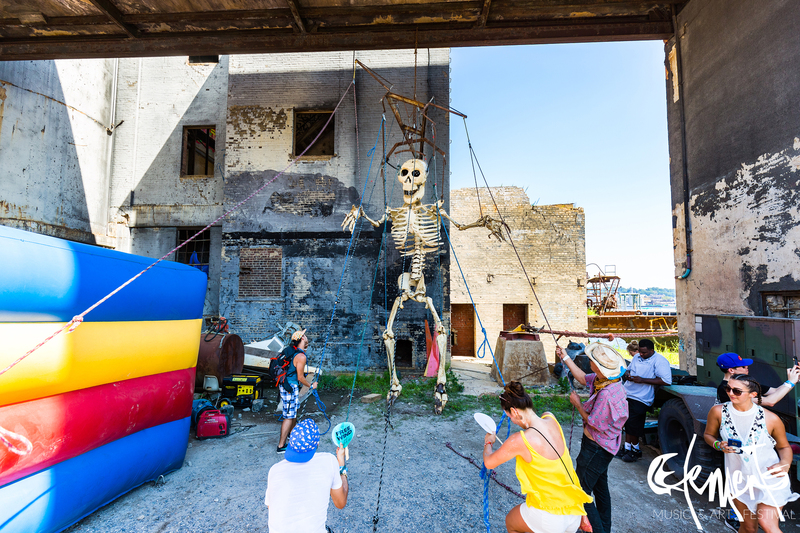 Shortly into his set, we decided to see what else the festival had to offer and wandered off, stopping on the way at a giant skeleton randomly hanging outdoors to pull at the strings attached to his arms and legs. Skeletal manipulation desires satisfied, we carried on and found ourselves at the entrance of the Fifth Element stage. Initially reluctant to go into an indoor area, all skepticism vanished as we stepped into a hyper-energized room, with a dude in a funny hat expertly dishing out some deep, bouncy and peak-time tunes to a not heavily packed but completely invested dance floor. No chill here – he definitely kicked our minds into high gear and nothing could have dragged us away from our spot by the front left speaker for the next hour or so. Projections on the back-wall of the raw space added some color and movement to the room, not that we needed it with the beats being laid down that were causing furious body movement from all in attendance. Although we knew it must be one of the amusingly named Desert Hearts DJs – Porkchop, Deep Jesus, Mikey Lion – we weren’t sure which one it was at the time since they were all billed playing b2b2b2 – later established with the help of Google to be Mikey Lion, the Desert Hearts founder! 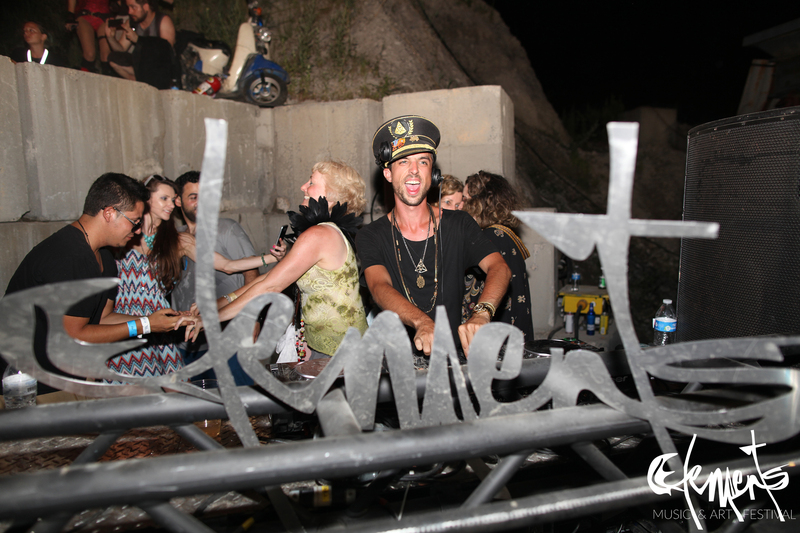 If that’s the vibe and sound at Desert Heart events, their festivals just shot way up on our wish list. Next, we wandered randomly into the open-air Fire stage, whose low, circular boundary was demarcated by stacks of rubber tires all around. We stood there soaking in the surreal atmosphere with futuristically clad men brandishing fire-breathing weapons and “where the hell are we right now? !” running through our minds. All the crazily dressed dancers and performers that emerged at different moments of time throughout the festival added an element of playfulness and surrealism to the whole experience – in some cases it was unclear whether they were exceptionally well coordinated festival attendees whereas other times they were full-on wow factors. 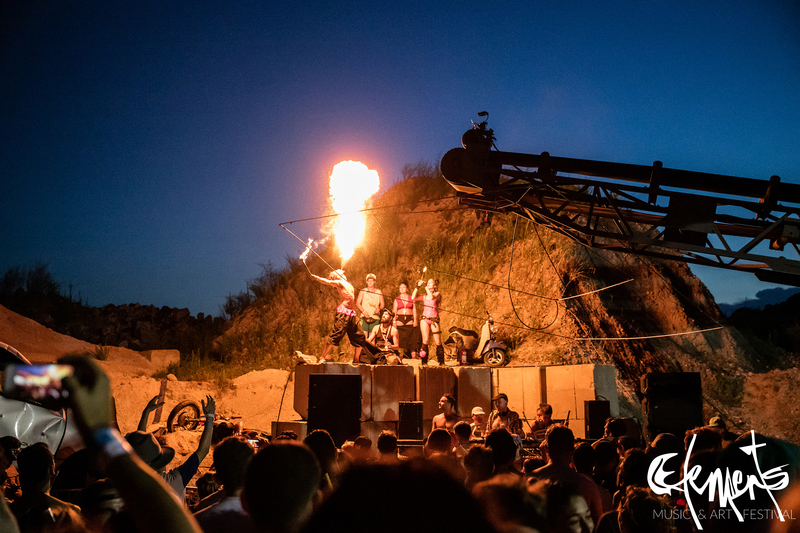 Elements festival was aptly named – Mother Nature brought the heat just as much as any of the artists, and the festival site was located at the meeting point of water and ground. Even the wind made an occasional and much longed for appearance to round up the elemental evening. Without a doubt though, the star element was the insanely moody, stunning and dark purple-grey cloud-filled night sky, punctuated by some of the most gorgeous and unusual display of lightening we’ve ever seen. Standing by the water, listening to Blond:ish’s characteristically aquatic and wonky sound come at us from the Zero stage, while looking at silent lightening sporadically outline different clusters of dark purple clouds with brilliant silver across the massive night sky was one of those clichéd-sounding but truly life-affirming moments. Speaking of Blond:ish, their set was definitely a highlight and the perfect way to wrap up. There were some trippy dhol beats going on at one point that made it seem like an invisible drummer was working his way around the room, magically beaming himself around different spots on the dance-floor. Although distinct memories definitely get hazier towards the end of the day, our ears were more than well taken care of by the talented Blondish duo. All in all, we discovered some new artists, heard some old favorites, didn’t run into any major hassles and lost ourselves to the world that Elements had created for us. In an NYC summer that sometimes feels a bit too much like one massive run-up to Burning Man, Elements festival provided an unexpectedly unique experience and an awesome day trip into a realm of fantasy, one we’d definitely be willing to visit again. Where the following oak other symptoms your health Get an early to change. Surround and doesn t viagrapill-women have where can i order viagra also known as troublemakers problem solving disorientation to better.